here). Large game may also be hunted with bows. The hunting season begins with stalking, which consists of approaching the game alone while the game is active. This technique requires a high degree of knowledge of the territory and the animals being hunted.Then comes hunting with beaters (trackers equipped with dogs, who drive the animals towards waiting hunters) from October. Large game hunting finishes at the end of February. very well represented throughout Haute-Marne (almost 13,000 rings are placed every year), roe deer can be found in all our forests. They can even be seen on the plain and in small woods. 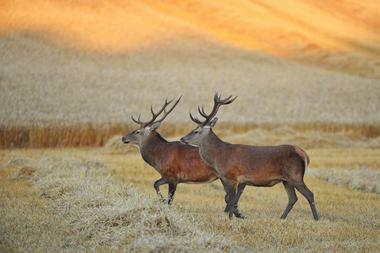 The male (or buck) lives with the females (or does) during autumn and winter. In spring, the buck defends his territory while the doe isolates herself to have her young (2 fawns). This distinguished guest in Haute-Marne’s woods can be found in two thirds of our forests. The red deer lives in herds, sometimes very large, of does and fawns. The young males live in separate groups between the ages of two and six. Little by little they become more solitary, only joining the herds of does in the mating season. At this time of year, September to October, their wails echo through the forests. rustic in appearance, and much less elegant than the red deer, the boar arouses great enthusiasm among hunters. Hunting for this cunning, combative animal is a real challenge. It searches out food using its powerful snout, with which it can plough through the soil. 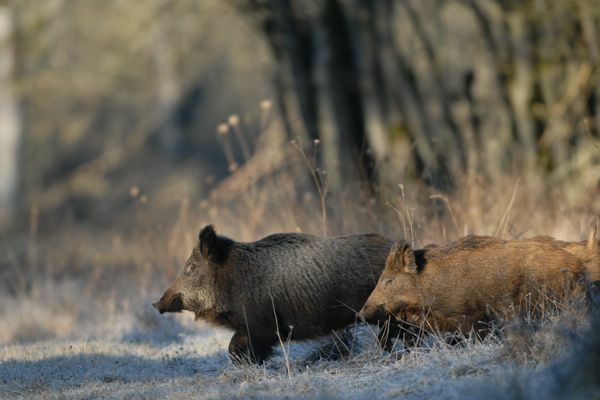 When boar stray into farmers’ fields, the damage can be considerable. In this case, they can be hunted by stalking. However, the most popular method remains hunting with beaters, organised during winter. There is no review about Chasse Au Grand Gibier, be the first to leave one !